On January 24, 2001, I received a parcel with a treasure trove of documents from John Goldsmith. His introductory letter noted that he had participated on the March 24/25 Berlin Raid - and returned intact. He enclosed the battle order for the raid listing all 17 aircraft and crew as well as his personal notes, and a contemporary newspaper article on the raid. A list of operational missions by 625 Squadron from October 1943 to April 1944 included target names, aircraft dispatched (3 to 19) and losses for each mission. Losses varied from nil to three per raid. In addition, he provided contact addresses for Tim Dougal, an Oxford professor writing a book on the history of 625 Squadron and Ramsay Turner, Honorary Secretary of 625 Squadron RAF Memorial Association. A follow-up phone call proved him to be a wealth of knowledge. His memory remains sharp as a tack and contrary to regulations, he kept notes on each mission flown. Following the Berlin raid he had vivid recollection of the disastrous Nuremberg trip later that month - brilliant moonlight and repeated explosions of bombers falling to flak or night fighters forced him to retreat to the seclusion of his navigation cubbyhole. He recalls the raid at the end of February 1944 that was preceded by a heavy snowfall. Before take-off, air crew were called out to assist ground crew in shovelling runways clear. On the take-off run, their aircraft was damaged, losing its radome. En route, the mid-upper gunner was incapacitated by cold exposure and other crew members took turns manning his position to successfully complete the trip. 1. Crew Photo - May 1944. Front (L-R): P/O John Goldsmith, navigator. P/O Brad Bradshaw, pilot. Sgt. Skids Brakes, engineer. Back: Sgt. Bob Wright, wireless operator. Sgt. Jack Cavanaugh, rear gunner. Sgt. Butch Sutcliffe, mid-upper gunner. Missing: Jock Gunn, bomb aimer. John completed his first tour with 625 Squadron and then volunteered with 156 Pathfinder Squadron. On his 44th operation, August 26/27, 1944 to Kiel, his credit account with Lady Luck hit a profound low. He was the volunteer navigator on Flt/Lt. Bob Etchells’ crew when they were mauled by a night fighter over the target. The combat resulted in the fighter retreating in flames but they did not escape unscathed - battle damage included two starboard engines disabled, port tail plane fragmented, bomb bay frozen open, and port main gear extended. The run for home base took a detour as the port inner engine caught fire - the mist shrouded North Sea beckoned. At this point, Lady Luck had second thoughts. Bob Etchells pulled off a textbook ditching at night on the unforgiving North Sea. All seven crew members survived, uninjured, to scramble into their leaking dinghy. It was none too soon as their Lancaster PB 302 slipped below the surface four minutes after ditching. The next day, they transferred to an airborne life raft dropped by an Air Sea Hudson. On the second day, they were plucked from their disintegrating craft by a Danish fishing boat. After transfer to an Air Sea Rescue Launch, they landed at Grimsby - 80 hours after leaving England. John has chronicled this adventure in the 1971 “The Lancaster at War” by Mike Garbett and Brian Goulding under the appropriate chapter “Seven more for the Goldfish Club”, a club exclusive to wartime air crew that survived a ditching. In October 1944, John returned to Canada and put in a request for flying duties that did not involve excursions over large bodies of water. He was promptly posted to the RCAF Meteorological Flight making 500 mile jaunts over the Atlantic between Yarmouth, Nova Scotia and Bermuda! During these flights, he was credited with rediscovering the Spicer Islands located in the Foxe Basin south of Baffin Island. In 1952, John was further honoured by the Ministry of Energy, Mines and Resources with Goldsmith Channel being named to acknowledge his contribution to northern geography. This body of water is located between the northeast tip of Victoria Island and Stefansson Island. It is indeed a rare accomplishment for someone still living to have a geographical landmark named after them. His military career included station adjutant at Goose Bay and a two year stint with the USAF in Hawaii, participating in the Korean Airlift in 1951/52. 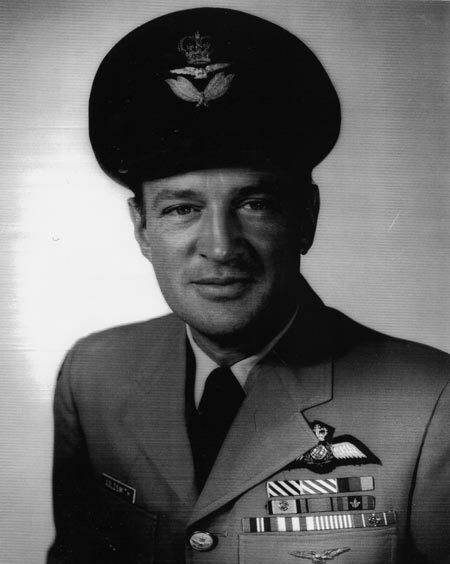 After completion of Staff College in Toronto, he was selected for training as an airborne intercept observer to fly in CF-100 all-weather fighters. In 1960, he was given command of 425 All Weather Fighter Squadron and promoted to Wing Commander - a unique accomplishment for a navigator! Under his leadership the squadron was awarded the Steinhart Trophy - Most Efficient Fighter Squadron in Air Defense Command. John closed out his 33 year military career with postings to NORAD as Deputy Director of Operations in Great Falls, Montana and Director of Operations in St. Margaret’s, NB. For the next 10 years he ran a tax and financial consulting business in Vancouver, BC, retiring in 1988 to Sidney, BC where John and Vicki, his petite energetic soul mate, enjoy their immaculate ground-level townhouse overlooking tranquil Tsehum Harbour. Born in Halifax, Nova Scotia, John has an inexplicable affinity for water - a true Goldfish through and through! With the benefit of John Goldsmith’s excellent reference library, I was able to solve the mystery of Pilot Officer Al Normandin. 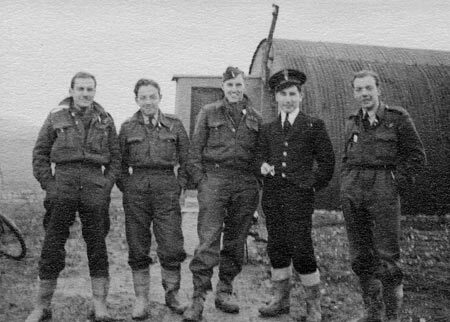 In a 1943 sepia photograph of my uncle and his crew, in the gumboot swallowing mud of Kelstern, he is identified as the mid-upper gunner. However, by March 1944 he had been replaced by Sgt. Al Nixon. Frank Magee could remember an earlier mission from which he and Al Normandin were ordered as “spare bods” on separate crews. In the crew bus they sat across from each other en route to the aircraft dispersals. On disembarking at his Lanc, Al held out his hand and wished Frank “Good Luck”. Frank shook his hand and responded, “I will see you for breakfast, Al” - Frank kept his part of the bargain, Al Normandin failed to return. I found the answer in the appendix of Alan Cooper’s “Bombers Over Berlin”. 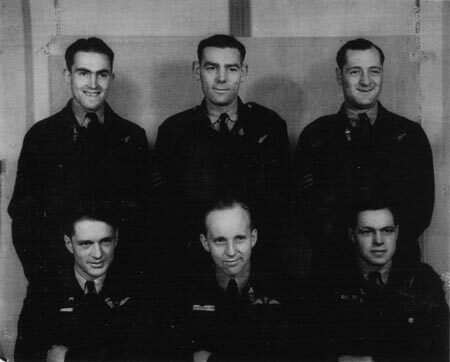 The crew of Lancaster JB 122, piloted by Flt/Sgt. R. Gallop are all listed as killed on the January 30/31, 1944 Berlin raid. PO Al Normandin was listed as the mid-upper gunner of that crew. The cause of their demise (flak, night fighter or mid air collision) and place of rest are not noted - such are the fickle fates of war. I found it remarkable that my original article brought to light two Caterpillars - Frank Magee and John Munro - and one Goldfish, John Goldsmith, alive and well over 50 years after their common connection as air crew of 625 Squadron over Berlin on March 24/25, 1944. It has increased my resolve not to forget on November 11th - a minute of reflection for my Uncle Jack and John Munro and a telephone call to Frank Magee and John Goldsmith to maintain contact.